Social Media is like a wild fire, if you share something sensitive on social sites, it takes no time for it to go viral across the country. Recently, one such message was shared enormously on Whatsapp which is a free messaging platform. 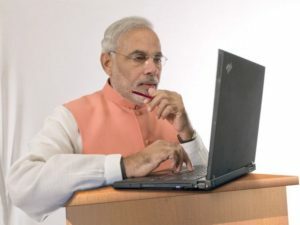 The shared message claims that our PM Narendra Modi has started a free laptop scheme where people can get laptops for free. If you have received or seen such messages, then don’t share it, just ignore it. The message should look like this”प्रधानमंत्री फ्री लैपटॉप वितरण योजना 2017, Modi Free Laptop, मोदी सरकार की तरफ से लैपटॉप वितरण आज से प्रारम्भ, अपना लैपटॉप आज ही बुक करवायें”. Currently, the Narendra Modi Free Laptop Scheme surfaces online message is going hell viral on Whatsapp. Millions of people have started sharing such messages on the popular messaging platform Whatsapp. First of all, the message is absolutely fake and should be considered as Spam. The reality is that Government didn’t announce such schemes anywhere in the country. The links of the sites which you find in the spam Message is just another spam website created by some spammers. Just in case, if government announces such scheme, then the news would be broadcasted on almost every Tv channel, but in this case, no channel has broadcasted any news regarding the Narendra Modi Free Laptop Scheme Surfaces online. If any such news comes across, then the registrations for the Scheme would go only through the Government’s official website. If In this case, the link which is being shared doesn’t look like an official site at all, and the site contains only one page which is really odd. Once you land on the site, it asks your “Full Name,” Your state and the brand of the laptop which you want to have. After that, it asks you to share this message with your friends on social media sites to unlock your prize or to claim the prize. We highly recommend you to stay away from such messages and sites. Such messages and sites are shared by spammers with an intention to seek your details. The details may contain both personal as well as nonpersonal. However, ignoring such messages is the best thing which you can do. Browsing such websites might affect your device with it’s malicious ad containing codes. There are over 100+ sites like My free digital India; Free laptop scheme surfaces online, and many other which are claiming to provide free stuff in the name of government. Well, we can’t do much about these websites other than blocking, However completely ignoring such messages and sites might reduce the numbers of such websites. Once again, if you ever receive such messages not only WhatsApp but also other sites like Facebook, then immediately report it and block the person who had sent you the message. Don’t forget to share this article with your friends and family members to make them aware of these scammy and fake messages. Srinivas Ready is a member of TechieBlast's team. He loves writing and providing valuable information in the technology field. You can reach him using the contact us page for any queries and recommendations.